June in Idaho is one of the best months I believe to have an outdoor ceremony. It hasn't reached the extreme temperatures yet that you would typically find in late July and August. From what I have seen it is a bit easier to find a venue as well. August by far is the hardest month to find a venue and many other necessities that a bride and groom need for their wedding. I often book the month of August over a year in advance. June is fabulous. Kyle and Jessica chose June for their ceremony at the beautiful and one of my favorite venues, Elkins Resort. Elkins is located at the north end of Priest Lake, Idaho. Many if not most of my clients are fun, super fun, people. It is not uncommon to see lots of tattoos and crazy colored hair at weddings I photograph. This was one of those weddings. I am a very spontaneous photographer and often come up with shots on a whim. For this image I wanted it to appear as if the groom and groomsmen were running along the ledge of a building. 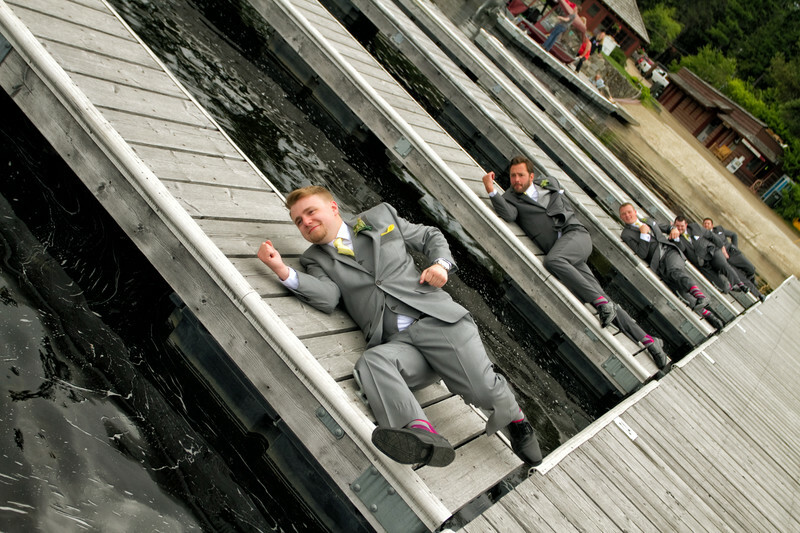 Some people do not catch it at first, but they are actually laying down each on a dock in a running position. This is the type of photograph when I am done photographing a wedding that makes me say "Wow". One of the things I also love about this picture is if you look closely in the background you can see a youthful girl laying down on the dock imitating the boys. It may be a bit odd, and even outside the box, but that is what I was going for. Hope you find this photograph as unique as I do. I also hope you consider a June wedding at Elkins Resort. Location: 404 Elkins Rd, Nordman, ID 83848. Keywords: Wedding Photography Priest Lake (3).